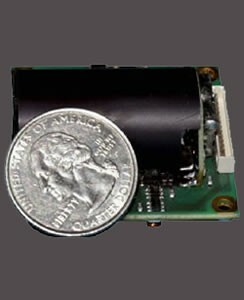 LDS30M OEM Laser Module for Distance Measurement - HiTECH Technologies, Inc. The LDS30M is an OEM laser module made to integrate laser distance measurement capabilities into existing measurement equipment. It is intended for general distance measurements that require extremely fast data acquisition. It provides up to 30,000 centimeter-precise measuring values per second – up to 30 m without a reflector. With appropriate reflectors the LDS30M reaches objects at distances of up to 250 m. Compared to the industrial laser distance measurement gauge LDS30A only the IP67-housing is omitted. The interfaces and power supply systems are designed for direct connection to microcontrollers or SoCs. For industrial applications the LDS30M is also available with an additional interface board, which provides a 24 V power supply and standard interfacesl like analogue current output and RS232 or RS422. Due to the invisible and eye safe laser (905 nm) the LDS30M can also be used in public areas.